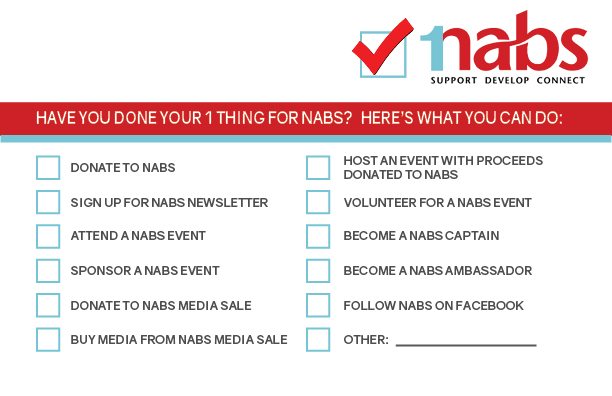 Its easy to make a difference - that's what 1 THING FOR NABS is all about. At the end of 2015, NABS helped support over 1,500 individuals and families across Canada. Whether through the 24 hour helpline, counselling, short-term financial assistance or other services, with your help, NABS has been able to make a difference in the lives of those in the marketing and communications industry. By the end of 2016, that number will be close to 2,000. Download this checklist and share it with a friend, colleague, or family. Help in a variety of ways, from making a donation to raising awareness within your company or attending an event. Copyright © NABS 2015. All rights reserved.